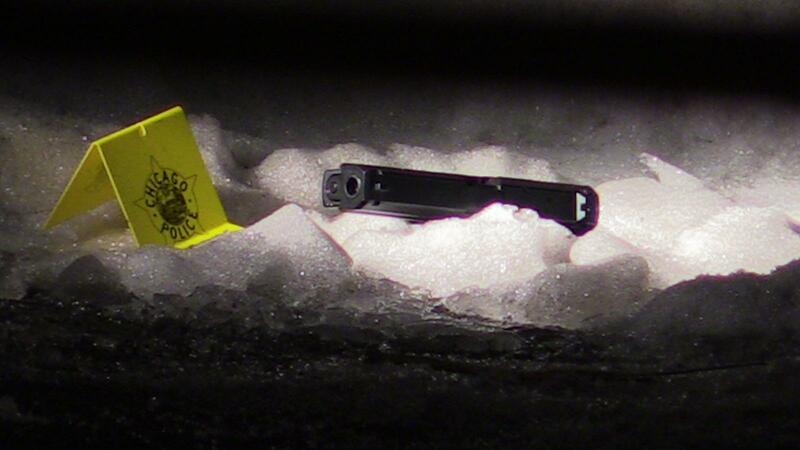 A handgun used by the armed robbery crew lies in snow near 57th Street and Martin Luther King Drive. 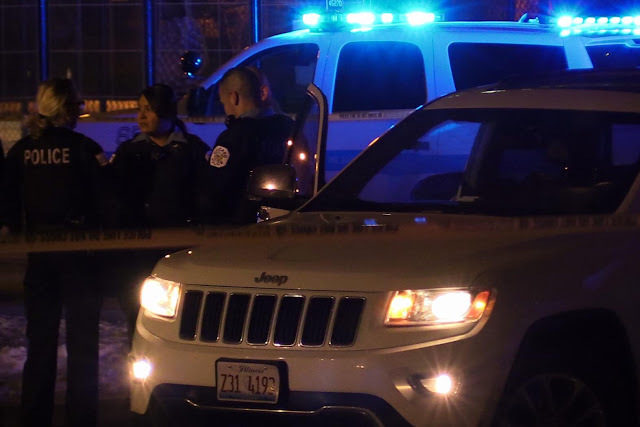 Police early today arrested two members of a suspected 4-man armed robbery team that seemed fearless, if not careless, as it pulled off dozens of hold-ups over the past week on Chicago’s North Side. Five of the robberies took place late last night and early this morning in a final hold-up spree that swept from Uptown to North Park. • 10:30PM — A gunman emerges from a white Jeep Cherokee in the 4000 block of N. Clarendon and carjacks an Uptown man who's unloading Christmas gifts from his idling SUV. • 11:15PM — Two young men rob a victim at gunpoint in the 1400 block of W. Winnemac in Uptown. • 11:30PM - A man is apparently pistol-whipped and robbed by three men who emerge from a white SUV near 1401 W. Winona, also in in Uptown. • 11:54PM — A man is jumped and robbed by four men who emerge from a white vehicle and display two handguns in the 4800 block of N. Oakley in Lincoln Square. • 12:06AM — 17th district officers are flagged down after four victims are robbed in a single incident near Kedzie and Bryn Mawr in the North Park neighborhood. Again, the victims reported that four occupants of a white Jeep Cherokee were responsible. Following the pings of a victim’s cell phone, police quickly learned that the Cherokee had entered the Edens Expressway. For nearly an hour, Chicago police located, pursued, lost, and then relocated the Cherokee as it raced all the way to Wolf Lake on the city’s South Side before heading back north. Two men were arrested seconds after bailing out of the Jeep near 57th Street and Martin Luther King Drive just after 1 o'clock this morning. At least one weapon was recovered. 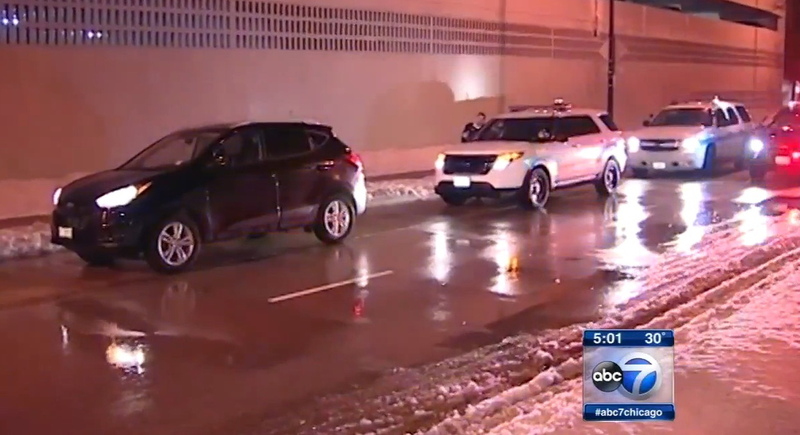 Two other offenders got out of the Jeep before its final stop—either during a gap in the police pursuit or before the vehicle entered the Edens Expressway, police said. Investigators believe they have strong leads on the missing men's identities. As cops hunted the suspects across the city overnight, the extent of their crime wave was revealed by a police radio dispatcher who told units that the wanted men were “responsible for 28 robberies in the past 6 days.” That’s 28 robberies before last night’s action. A couple of people who crossed paths with the robbery crew in our neighborhood shared their firsthand accounts yesterday. I was walking eastbound on Wellington at about 10:00 pm between Sheridan and Inner LSD. The black SUV drove along side me as the driver mumbled some sort of question. After I asked him to speak louder several times, he finally asked how to get to Diversey & Argyle. They followed me down the street, then stopped in the middle of street: a guy in a red hoody with his hands in each front pouch pocket got out from passenger side rear and followed me around the corner to front of my building. Once he realized I was entering into a building, he turned around and went back to the SUV. The car pulled up as I was turning the corner and a man approached me after coming around the back end of the car. I ignored him and continued on. He said something like "Hey man" to get my attention. When I turned around, he was pointing a gun at me. I took off running on Wilton towards Belmont (perhaps not the greatest decision). He got back in the car and it sped down Wilton towards me, but ended up passing and turning westbound onto Belmont. Based on this, I think they aren't trying to shoot or kill anyone here, but perhaps it's not worth taking the chance I took. Also, ABC7 and NBC5 both spoke with the Chicago’s Pizza delivery driver who was robbed by the crew early Sunday. We will continue to follow this story as further arrests are made and charges are filed. You can support CWB Chicago's reporting efforts with a donation to our tip jar.